Industrial pallets play a key role in storing and transporting commercial products. The first ones were made of wood and came in one basic design. These days, pallets come in many different types of materials and designs. Each type has its own strengths and weaknesses. They also differ by cost, ease of use, hygiene and eco-friendliness. Knowing the differences can help you choose the right one for your shipping and storage needs. Wooden pallets weigh more than other types of pallets, so they cost more to ship via air freight. They are hard to clean, and prone to water damage if left outside. Splinters, nails, warping and shrinking can create safety risks for handlers. Plywood pallets are surprisingly strong for their weight. They offer a smooth, clean surface. They don’t soak up much moisture. And they can be used for rack stocking or layer stacking. Plywood pallets don’t work well for long-term storage. They are hard to store in racking and can suffer water damage if left outside. Despite these shortcomings, plywood pallets are a good choice for products that require sturdy packaging, such as electronics, medical, and computer products. Presswood pallets use intense heat and pressure to mold dried wood fibers into one solid piece. This creates a strong, lightweight wood pallet that offers a lower-cost alternative to plastic and metal pallets. Presswood pallets can be stacked on top of each other, and are easy to handle. They resist insect infestation, can be used many times, and are 100% recyclable. Like other wood pallets, presswoods can suffer water damage if left outside. They can be hard to store in racking. And their use can be limited, as many warehouses are not set up for this type of pallet. Made with steel and aluminum, metal pallets are stronger than wood and plastic pallets and are very durable. This makes them ideal for transporting heavy goods, as well as air-freight, at-sea and long-term outdoor storage. Aluminum pallets are a favorite of large industrial companies due to their strength. Restaurants and catering firms like them because they are easy to clean. On the downside, metal pallets cost more to transport due to their weight. On the downside, they cost more than wooden pallets. They don’t store well on shelving. And cracks or breaks require melting and remolding to repair. These lightweight pallets – made from recycled materials – are strong for their weight. They can be customized to fit the product being transported. They’re easy to clean. They don’t splinter like wood pallets. And their light weight reduces transport costs. Cardboard and paper pallets aren’t designed for heavier loads and don’t hold up well in outdoor conditions. 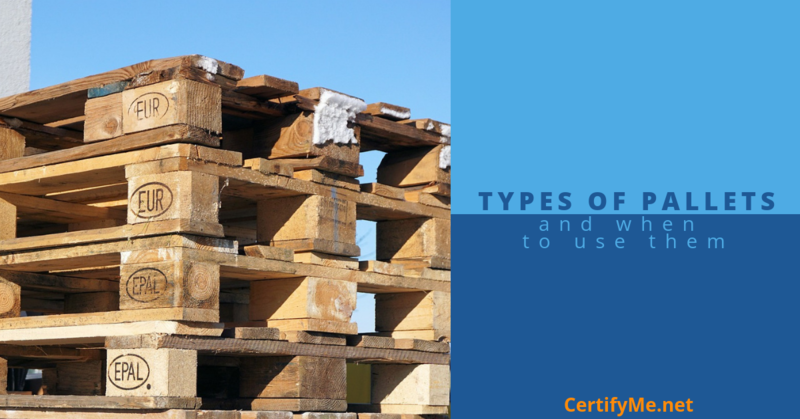 The two main tools for handling pallets are jacks and forklifts. With a top lift height of under 10 inches, manual jacks are best in limited space with ground storage. They can only lift up to 5500 lbs. Using a jack to move a load that exceeds capacity can damage the equipment and put employees at risk. Forklifts are the right choice when moving heavier loads stored on shelving. They handle better than pallet jacks. They a have much higher lift capacity. And they reduce operator fatigue because they are motor-driven. The choice between pallet jack and forklift depends on the number and weight of pallets moved daily and the type of storage. Don’t use pallets to lift people. Don’t store empty pallets on end. Use a pick hook to reach products at the back of a pallet. Always use protective equipment (gloves, safety shoes) when handling pallets. Don’t use damaged pallets or types not rated for the task. Keep the work area free of pallet debris. Don’t stack pallets higher than four feet.